Usually, a woman's day begins by drowning herself in household chores...forgetting herself for others. But this lady starts her day by posting a beautiful, inspirational quote by her every morning in various communities at SHEROES - a motivational post...something that has a deep spiritual vein. And this left me a bit amazed because my life experience tells me that only a passionate person can have enough courage to change the course of life in such a poles-apart way. So let's know Rekha Rani's story in her own words. My first question to her obviously was why the switch from the Pharmacy? The chirpy lady, who hails from Tirupati, Andhra Pradesh, laughs as she begins detailing, "Mahima I did take up a job as a Pharmacist, but later realized that It was not my calling in life. So when marriage happened, post my daughter was born, I took a sabbatical to take care of her. But didn't join back work as a Pharmacist. Rather I moved myself towards social services; conducting cultural activities for children around me; conducted free stitching & tailoring classes for a large group of women from a rural background and equipped them well; worked for The Times of India as NIE consultant, visited more than 100 schools, taught them art & craft, etc. And after dabbling through various things I liked doing, I finally got myself trained as a Certified Trainer and Counsellor." And that's also, when she says, beginning her spiritual journey through Yoga and Meditation. And she began counseling women, at times for free who were in dire need and could not afford the fees. Rekha recalls, "Life for me was not easy. Gender bias, difficulty having someone who can match my frequency. I almost stayed all by myself with my thoughts, questions. So I knew I had to be the change in some way to help others. And today I am working as a Motivational Counsellor, just aiming to make a meaningful contribution and spread more smiles." Not many know that she is also a trained classical vocalist who as an entrepreneur is also running a fashion boutique with a friend. And atop she also paints wonderfully! Take a look at this artwork! But then there is always a dark side to a story of courage, and Rekha doesn’t shy away to reveal the same. She says if she hides anything how can she be an inspiration to others. She asserts that let alone others if she shies away from her own life, how will she push boundaries to rise and shine and inspire her own daughter! Thoughtful, indeed! "Mahima, it hasn't been an easy journey. I am a mother to a 23-year-old girl. And in my journey to upheaval myself, I have suffered from Arthritis, migraine, hyper-acidity and excessive body weight. And amid all these tough circumstances, I also add - Yes, I faced challenges in terms of relationships...strain in the relationship, parenting, money, career...but never stopped walking even when I was left devastated and in bankruptcy! What made me stride though, was the fact that I didn't hesitate to change. I didn't hesitate to move out of the city...my comfort zone when things demanded a change," Rekha shares all in one breath, like an open book! I am a little amazed at her transparency and her courage. Courage to accept her failures, her courage to be the change. She goes on, "When it was time to take care, I did with commitment. At the same time, questioned what is not appropriate that was not me before. And one thing that came back again and again to me was that the biggest lesson, nothing is impossible when it comes to health. And thus I took to Yoga and Meditation. And if you see a changed me today, a woman who has risen like a phoenix to motivate others, then I will credit practices of spirituality and yoga & meditation." Clearly, we can read, Rekha was pushing boundaries, moving out of comfort zone, consciously. She decided to move ahead forward, learning, seeking to chase the inner calling of life and she says that's what transforms us from the inside." And then she says one fine day, SHEROES happened to her through social media. She says she began motivating women through her posts, quotes, poems, learnings in life, and much more. "I instantly fell in love with SHEROES since I felt the 'belonging-ness' here. One day I received a call from Lola Jutta asking if I could be the Guest Moderator for a Community Chat. Since then I don't think I have looked back. In due course of time, I even started a series on the well-being that's an essential part of anyone's life using simple topics, keeping the language simple. SHEROES is a commendable space. I love to be here since women feel safe to talk here, be here. It takes a lot of strength to build trust. That is what I am doing...building trust in human relationships through motivation and spirituality. Post SHEROES… I have an extended family, unconditional love, a lot of respect and much more," says a beaming Rekha Rani who is a start of the YOGA AND MEDITATION COMMUNITY and is an inspiration at ASPIRING WRITERS' COMMUNITY. 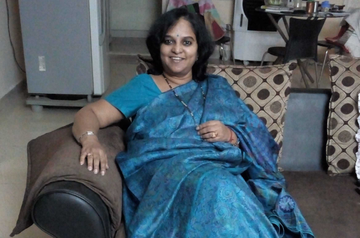 "Writing is my passion, so I keep penning blogs and also pen stuff especially for SHEROES too. My blog speaks mostly about life and life experiences. And I think nothing motivates people better than taking getaways from real-life," opines Rekha. As Rekha speaks, I introspect. Why can't be people so compassionate in life like her? Why can't we hold hands to make world a better place? The world surely needs a lot of good for survival. Love is the only component that can bring goodness and awareness in the path. Isn't it? "Hey, you are the most important and integral part of the world and tell this often to yourself. Love yourself the most only then you will be able to give unconditional love to others. Never stop expressing your creativity. Take a break...it is important to rejuvenate. Trust your inner voice. Do not let the inner critic take over...tame it. Your health...your priority. Follow your heart. Make gratitude a part of a day." And I know here 'YOU' stands for all of us who are reading her interview. If #HerStory has motivated you, do share and also care to leave love in comments column for Rekha. Because even a strong person needs hugs, isn't it? You can follow Rekha on SHEROES. You are such an inspiration Rekha Rani. I am amazed. You are so talented. Proud of you. An inspiring read Rekha Ji. Your positivity and compassion towards life despite all the ups and downs is rare. Your views about being a giver to oneself has given a whole new meaning to it. That is so true...I love reading her quotes and writeups on WordPress.Ms Rekha Rani is an inspiration to not just me but also many others.May we all have clarity of mind as she has! Our Rekha Rani is Motivation and Inspiration Personified! Happy and proud to be associated with her personally. She's a true friend, my healer and has always been there whenever I need. Lots of love and hugs to you dear #RekhaRani. Omg!!! Rekha Rani....i miss you everyday. You're such an inspiration. I love your quotes, which have deeper meanings of life. Waiting for your more quotes. Lots of love and hugs😘😘😘😘 ..
Rekha ji our mornings are incomplete without your quotes...the fighter in you attracts me. You do nudge me into deeper self introspection.